The groups Microsoft focused Solutions Architects Sam and I took time out of a busy schedule to explore some of the rapidly evolving technologies showcased, and mingle with some of the leading vendors in the Azure and 365 ecosystems. For late February, the unseasonably warm and sunny weather made it a pleasure travelling into the heart of London’s Docklands to reach the ExCel convention centre at Custom House. 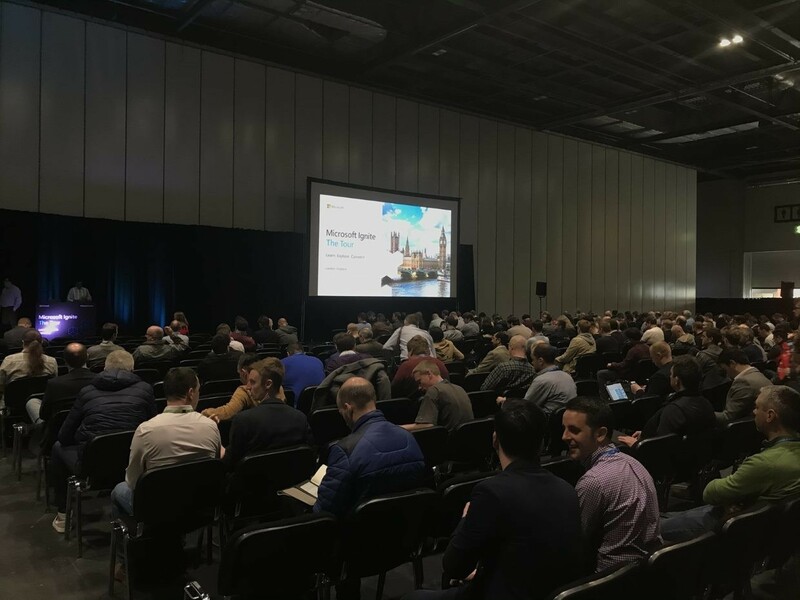 The venue is enormous with the Microsoft event occupying many of the cavernous halls of ExCel close to the London City Airport. Barracuda showcased some of their leading physical, virtual and cloud-based security appliances from Next-Gen Firewalls to their Cloud Backup service designed to backup Office 365 Mailboxes, SharePoint and OneDrive for Business data in a simple and reliable way. There was also a preview of their new Barracuda Cloud Security Guardian, an agentless Software as a Service (SaaS) with end-to-end visibility of your cloud security posture, designed to make it easier to keep applications and workloads secure on public-cloud infrastructures. With increasing awareness around the importance of good security, having a service to police this throughout and be able to orchestrate and deploy automated remediation needs further exploration. The guys from Citrix spent time discussing some of the benefits of Citrix Cloud in combination with Azure and also some of the upcoming optimisation pack tools they are working on for Office 365 and Teams Web Interface to improve the performance of voice and video in Citrix. Improved Citrix integration for Teams is one item on our wish list we can’t wait for! As expected, Teams was a theme that featured in a lot of the Modern Desktop sessions, so it was great to see some of the new ‘designed for Teams’ devices and Unified Communications room solutions for Teams conferencing and calls by Logitech and Yealink. The Yealink video and voice devices appear to be a polished and cost-effective solution for organisations embracing Teams, something we hope to explore further with an extended test in our own environment. With so many main presentations across topics as varied as ‘migrating to Azure’, ‘maintaining an Azure Hybrid model’, ‘deploying modern desktop’, ‘optimising teamwork in your organisation’ and ‘securing your organisation’ to name just a few, it was often difficult to decide which was most important or would be most useful when forced to choose, even more so when considering there were extra breakout sessions being held for even greater subject depth. Whilst Sam concentrated on developments for deploying and managing modern desktops such as AutoPilot, Intune and Microsoft Managed Desktop, I was drawn to some of the sessions delving deeper into Azure Information Protection (AIP), Identity and Access Management with Azure Active Directory and Microsoft Secure Score. Some of the facts and figures quoted around these services are mind-boggling; such as there being 1.1 Billion Azure AD identities, around 450 Billion authentications per month and that there are 150 Million devices managed by ConfigManager and Intune! Across all the sessions, Microsoft demonstrated a drive to make really smart solutions simple to deploy and maintain security as a key feature. Demonstrating the capability of tools such as Azure Trusted Advisor, Secure Score and the Microsoft 365 Admin Center, then add in the partner relationship for additional value and reassurance. One of the most illuminating sessions was a preview of the recently announced Windows Virtual Desktop delivered on Azure. Due in the 2nd half of 2019, this allows multi-user Windows 10 desktop capabilities in addition to the more recognisable Windows Server shared desktop experience familiar to Relational Database Service and some Citrix environments. Azure will bring a whole new level of agility, simplified management and cost-saving allowing users to log onto a fully featured and customised Windows 10 desktop experience from anywhere with Internet connectivity. With the acquisition of FSLogix in November 2018, Microsoft has been able to incorporate those technologies into this new Windows Virtual Desktop to deliver near-native or better performance for Office 365 workloads. Our two days at Ignite London left us buzzing: the sheer volume of relevant information and product demos was mind- boggling. Whilst many of the slide decks are available after the event, it was invaluable being able to talk directly with the people who live and breathe the development and evolution of some of the most exciting developments in public cloud, security and collaboration, something we strive to add into the mix to benefit our customers and partners.